The flame of the solitary candle lighting the atrium flickered, deep shadows filling the archways breathing sighs of foreboding. “This way,” Master Frank said, heading for a passage to the right, leading them past the entrance to Moag. As he crossed the room, Noel eyed the pitch darkness, suppressing a small shiver against the idea that the treacherous mist, he found hidden in those depths, watched him as well, with a certain eagerness. Moag was not quite finished with him, he knew. He had known for nine days. Master Frank and Emanuel disappeared into the shadows of the corridor. Noel hurried in behind them, Moag tugging at Noel’s bones, a siphon drawing him down. It was strange to think the people of the mountain had lived so long in the company of such a monster, without the slightest knowledge of its existence, and stranger still that the old man looked to Noel to help uncover answers as to why, when he was an outsider. The Mardraim had little time to prepare him for what would come next on their way to the cloister, but while he apologized for not giving Noel more warning, he assured him his ignorance of all the facts was necessary. The Mdrai had spent the past nine days uncovering what they could, in the hopes of understanding Moag and the apparent secrecy of the Felimi. According to him, the only reason anyone besides the Felimi knew about Moag was because Noel had turned up unexpectedly, wreaking his havoc, forcing a sliver of the truth out into the open. In their last few minutes together before reaching the retreat of the blind matriarchs, rather than tell Noel what questions to ask or give him any sort of guidance on how to handle the Felimi, the old man told him about his grandson. Almost two weeks prior, Harvey Frank, an adept empath, felt Noel speeding toward their mountain, come to ask the seers of old the meaning of a prophecy. Harvey had warned his elders that Noel must not be allowed to make it inside the mountain, but his advice was not heeded. The man believed Noel was being guided there by Om, against Om’s will, and that if Noel made it to their home, he would change the very path set out for the world at the beginning of time. 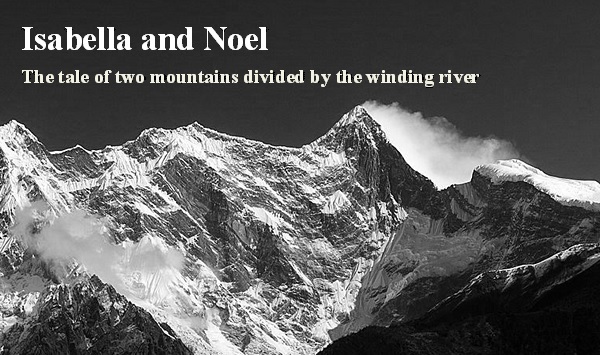 Noel had almost died in his quest to reach them, and despite knowing the outcome, despite all of the warnings he had given his elders, Harvey left the safety of the mountain, taking Isabella with him, breaking all of their laws in the process, in order to save Noel’s life. It was understandable that such an event could not be taken lightly. The Mdrai had needed these nine days to see how much Noel had changed. The passage the master led them down ended at a great, knobless door carved of gnarled wood, its frame and rounded lintel built of smooth, circular stones, so highly polished they looked wet, reflecting the little light that bled in from the room behind them. The capstone was engraved with a pictorial script that put Noel in mind of an ancient fairy ward, much like those inscribed above the three gates to Mag a Bon. This was not some ordinary charm for barring entry by outsiders. These powerful spells had sealed the Mag a Bon gates for more than two millennia. It was the sort of magic as necessary for keeping the inside in, as it was for keeping the outside out, if there was any truth to the stories told of that hellish place. As Edward Frank rapped twice at the door, sending a deep echo into the chamber behind them, Noel could not help but wonder if the Felimi hoped such totems would protect them against Moag, or if there was something else he should worry about, beyond the door. An enormous set of tumblers clunked and rattled to life, reverberating in Noel’s chest and teeth, making the silence that followed ring out deafeningly, filling his head with pressure. He wriggled his fingers in his ears to clear them, as they waited. After a moment, the door creaked open, no more than an inch, and the elder dug his feet into the floor, pushing his shoulder hard against the mammoth wood, forcing it the rest of the way. Emanuel quickly filed in on the old man’s heels, but Noel hesitated at the threshold. The room was a perfect dome hewn from the rock. More inscriptions, like those over the entry, covered the polished stone walls, each line interlaced in the spaces of the next, forming a magnificent web of binding all around them, even under foot. The smell of burnt sage and old blood stung his nostrils. The slight metallic tinge to the air pricked the tip of Noel’s tongue, causing the hairs on his arms to stand. The room was thick with magic. Seated upon a wooden dais level with Noel’s shoulders, the three Felimi waited for their court to convene. The elderly woman sat nearest the steps, looking old as the mountain itself but not at all frail. He might have been biased, considering their previous interaction, but she reminded Noel of the worst sort of witch, with her twisted bones and wildly knotted hair twined madly around itself, drawn up into one extraordinarily large knot that looked to weigh at least two stone, pressing her head forward and down, creating the prominent dowager’s hump on her back. Next to her sat the child, delicate as one of the porcelain dolls Noel’s mother collected when he was a boy. Though the girl sat upright, with all the poise of her station, her leather-clad feet did not quite reach the ground, and her toes swung in rhythm, keeping time with a melody all her own. Last was the young woman, Noel’s age, or perhaps a few years older, a long lost Nubian princess, her only flaw, her marked blindness, which somehow made her all the more attractive. Two seats at the far end of the platform remained empty. Noel expected the Mardraim to take one of these, but the man had already made his way to the gallery on the far side of the room, where the rest of the Mdrai sat in the front row. Emanuel was just taking up a space on the bench behind them, next to Harvey Frank. Noel had not seen him since the day the two of them went tumbling out of the darkness together. The door began to slowly swing shut of its own volition, and Noel stepped out of its path, into the room After a long minute the door rumbled closed, old tumblers turning over once more, locking them inside, leaving a heavy silence draped over the elemental remnants of magic that furnished the place. There was no knob on the interior of the door either. No escape, Noel thought, looking to the Madraim. “My Felo, as agreed, I have brought my guest, Noel Loveridge, to Fkat, that he might answer your questions regarding his arrival at our home,” Master Frank began, motioning for Noel to take the chair at the center of the room. “You understand these terms?” The woman’s blind eyes searched a point just over Noel’s head, even as she spread her fingers out across her knees. “I do,” Noel offered, before thinking his words through. He did not understand completely, and was going to question the meaning of the strange words the woman used, but he was caught off guard when she moved her hands. The action was deliberate, as though she knew he was watching. “This is… erm… sense? No, I mean…” He shifted in his seat, rubbing a hand over the back of his head. Quiet laughter broke from the gallery, and Noel turned to find Emanuel was the source. Master Frank and the rest of the Mdrai looked to each other in graven silence, before turning to face Noel’s rescuer, the man who had warned them Noel must not be allowed in the mountain. “Then you agree the Llendir continues to present a danger to our children?” the little one asked, her feet swinging a bit higher as she said the words. “His talents will prove useful to all of us during this time of learning, revealing far more about the rest of the world, and your guest’s purpose here, than we can possibly learn in Fkat,” the girl rejoined. Master Frank swallowed, turning his gaze to Noel, lips drawn sternly together as he retreated to his seat. “Yes, my Felo,” he answered quietly, as the Mdrai murmured low amongst themselves. The old man raised his hands, bringing them back to order. “You have come to beg the meaning of a prophecy your ancestors recorded long ago in their ancient texts,” the young woman scowled. “This is true,” her elder groused thickly. “You have traveled a great distance to ask us of a prophecy, however our children are not alone seers. Possessed of empathy, many among us are deeply affected by the souls of others. For an empath, there is little separation between one person and the next, or indeed between one and all. It can take many years for the empath to learn to discern the differences between individuals, but first it requires they learn to control themselves, which entails a great and continuous act of will for the young one, to guard himself against the constant presence of those around him. We have raised our children up to avoid many of the extravagances of the senses you take for granted in your daily life, extravagances which you find ordinary, even fulfilling, from pleasure to pain. You must understand that the uncontrolled extremes you live moment by moment have done great harm to our people. This mountain has long been a sanctuary to the empathy, even before we brought the remainder of our family to live in this place. In coming here, you have willfully disrupted its sanctity. Startled by how easily she had sensed his umbrage, Noel swallowed the mild flare of indignation that had risen inside him. “I… meant no… harm to your children,” he answered cautiously. “You do not deny you have endangered the lives of our young ones?” the child offered somberly. The old woman grunted, chewing on her tongue. Relief washed over Noel, his hand absentmindedly tugging at the remnants of hers, as though she was an old friend and they had both just received excellent news. Truly gone, for the first time in nine days. He stared around at the hundreds of incantations covering the walls, took in a slow breath, allowing the potent energy that protected that place to roll over his tongue, and looked back at the knobless door, locked tight, as much to keep the inside in as to keep the outside out, he thought. Nine days he had spent trying to shake her. A lonely cold set in, like his hand was naked for the first time, bare without her. “Young Isabella’s life is forever changed because of you,” the middle aged woman said, a hint of callousness in her tone. Her own hands were twisting in her dress tail again. This time she did not move them as Noel eyed her carefully and a strange sense came over him, that the woman had felt his anticipation, surprise… even longing… But not in her head. She had actually felt Noel seeking Isabella in her own hand. If he was not much mistaken, the woman, an empathy herself, had noticed Isabella’s absence first. “I am… apology. I am… glad…. she improves,” Noel offered. “You led her to Moag,” the child answered darkly. Noel shook his head. “I did not lead her. We… were never… together… in the dark.” He could not help but flinch. This was a lie. Isabella had been with him all along. He half expected the woman to call him out on his dishonesty, but the child spoke again. Noel shuddered visibly, but quickly recovered. “Mohamed?” he asked, glancing over at the gallery. “Harvey called me this.” The man did not look up at mention of his name. Noel thought of Taree back in Arnhem Land, his people struggling to hold onto their own traditions in the face of the same brutal humanity. “How I discovered you?” It had taken months for Noel to build that trust, months for him to be accepted as Yolngu. Taree’s people were his own people now. As old as their culture was, the Yolngu knew nothing of these ancient seers and empaths or their mountain home; they had only guided Noel to the Dreaming, because they believed the Dreaming contained all of the answers, from the beginning to the end. But what could the Felimi possibly do to stop the Dreaming from showing anyone else where they were hidden? Nothing. Their only recourse was to silence those who had helped Noel in his journey there. He imagined the destruction of the sacred spaces where Taree and his family communed with the Wangarr spirit. He imaged Taree and his family dead, all because of Noel. Were the people of the mountain not human as well? Peaceful and emotionless as they claimed to be, the elderly woman had struck Noel with a powerful curse shortly after he escaped Moag, and he was certain she would have killed him, if Master Frank had not intervened. And they used Moag, horrible as it was, like a guardian at their gate. They were so ashamed of the fact, their own children had been left completely in the dark about its presence. Noel did not know if the control the Felimi exerted over their people was necessary to protect the empaths, or if the blind leaders of this cult, for lack of better terms, were just afraid of losing their power. But one thing was clear—he could not put Taree and his family at risk. “You have my word, I will never… tell anyone,” Noel answered quietly, hoping he could steer the conversation far away from the natives of Arnhem Land. “No, you will not,” the old woman practically snarled in response. A prickling spread across the back of his neck and up into his jaws. He had spent the better part of nine days searching for a way out of the mountain that did not involve heading back the way he came, through the belly of Moag. Now he realized, as he sat there looking up at the three women, he had been afraid of the wrong thing. After months of hoping to find this place, hoping to ask these people about the prophecy in the Book of Ages, hoping that they might understand what had happened to their Last Hope, he had made it there, mostly in one piece, only to discover the Felimi and Mdrai had no choice but to do what was necessary to protect their people. If he was the only one who knew where these people and the location to the entrance to their refuge were hidden, there was no cance he was ever getting out of there. He would never see Phileas, the rest of his friends, or the old Iron Bones again. He was never going home. “No one… outside of this mountain… knows I am here,” he answered carefully. From this point forward, Noel knew he had to guard every inch of the truth. He could not tell anyone in that mountain about Phileas Foote’s extensive search of the Australian Continent or how Noel himself had seen a pattern in the Shaman riddle of looking ever North. He could not tell them of going to Taree and his months spent learning the ways of the Yolngu people. He could not tell them of drinking the toxic potion that led him into the Dreaming. His freedom was the price he would pay for everyone else’s safety. But he could hardly lie to a room full of empaths. “No,” he said, hoping she would not press for a more detailed account, but the child was already prepared with the next question. “No,” he answered, but it was clear they would not be satisfied until they understood, as the girl leaned over the arm of her chair to speak closely with the young woman and the Mdrai erupted once more. “I dreamt of Moag,” Noel added loudly. Silence answered him as every eye, blind and seeing, turned to face him. “What makes you believe you dreamt of Moag?” the old woman asked, her voice thick with disdain. “You suggest such a magic exists, after all this time?” the old man countered. “Might Om also grow? Might Om make things, we once believed impossible, possible?” he reasoned. “Young Edward!” the old woman reproached. “Forgive me, my felo,” he answered, the words suggesting submission, but his voice implying something else entirely. This was what the old man had been alluding to when he told Noel of Harvey’s premonition. Harvey believed everything would change. Harvey believed Noel was guided there by Om. Noel knew he was guided there, by the Dreaming. Could they be one and the same? “Unwrite Om’s way?” Noel asked, looking to Master Frank. The old man reached inside the folds of his tunic but paused, glancing up to the Felimi before proceeding. The eldest Felo nodded, waving her hand with casual indifference. Edward Frank crossed the room, drawing an old book, bound in purple linen, from the wide sleeve of his garment as he made his way to Noel. “This is your book of prophecy, Young Noel,” the man said, holding it out to him as he reached his side. “My book?” Noel breathed, instinctively reaching for it, then hesitating, drawing back his hand. “I… I never…” It had never occurred to him that any part of his own life had been designed by Fate. The old man gave Noel a moment, to let those words sink in, before he continued, “When a seer has a vision, we Mdrai record the veils, so we might see Om’s way and track when a prophecy is changed or completed. Changes do happen. The way is imperfect. However deviations are ordinarily vagaries, of little importance to the way as a whole. The fifty-seven prophecies you had left to complete, before entering Moag, can no longer be read. They are broken. You are not alone in this, I am afraid. Young Isabella and Young Harvey both have books of prophecy that are now impossible to read as well. We have no way of knowing what you were meant to do, prior to your encounter with Moag, only that where you stand now is quite outside the way Om set out for you in the beginning.” He nodded to the book and folded his hands at his waist, smiling that same gentle smile he always wore, the one that caused a peaceful hush to come like a quiet snowfall deep in Noel’s insides. “Moag…” Noel whispered, the master’s ease dulling the panic that rose within him, but not quite washing it away. Fifty-seven prophecies? How was it possible? “Moag did this?” How was it possible that anyone could have so much they were meant to do in one lifetime? And if Noel would no longer do those things… His chest tightened, and he clutched at his heart, suddenly aware of its painful racing. The room was deadly silent for a long while, as Noel struggled to come to terms with just what this revelation meant. He fought back the sting of tears, threatening his eyes, and picked up the book from the arm of the chair, more to give himself something to distract everyone else than to attempt to understand it, tenderly turning it open to the first page, his hands trembling, causing the weathered paper to quiver under his fingers as he ran them over the text. What have I done? he thought, turning page after page. “Christ, what will I never do?” he whispered, forgetting his Elvish as he thought of his friends, the other nobles, everything they had worked so hard for. “The Last Hope…” he breathed. Had it all been for naught? He found himself chuckling in answer to the curious mix of terrified uncertainty and overwhelming finality he felt warming his bones. Closing the book, he took a moment to compose himself, laid it aside, allowing the ill feeling of regret to seep through every cell of him. This ending was fitting for him, even if it was not Om’s way. “What is Moag?” he asked plainly, knowing the answer would not come easily. If the answer were simple, there would be no need for the Felimi to hide it. The old woman shifted, causing her chair to groan beneath her once more, her lips pressing together in a tight line, the weight of her brow, as it drew low and she breathed in through her nose, causing her drooping eyelids to sag deeper still over her cheekbones. “Moag is the end,” she practically growled. “The end?” Noel scoffed, matching her scowl. “I saw it, felt it… breathing in there. It is not some… not some…” He was trying to find the elfish words for ‘mythical, all-knowing force,’ but the words would not come, and it was just as well, he thought, considering he had been inside the Dreaming, and he would have scoffed as readily at the idea of the Wangarr a year ago, having yet to experience it himself. Clearly, mythical, all-knowing forces existed. Who was he to say such forces could not manifest as living, breathing shadows of the end of time tucked neatly inside some mountain just waiting to erase the destinies of any old wanderer, who happened upon one of its tunnels in search? The more appropriate question was how had Isabella, Harvey and Noel managed to escape it with their lives, if not with their destinies, intact? It occurred to him this is what they all wanted to know. He swore. “This does not concern you,” the young woman said, raising a brow. At this, Harvey Frank looked up, and judging by the look on the man’s face, Noel had finally said something important enough to warrant a response. Given everything he had learned there that day, Noel did not think waiting a few days longer to give the Felimi and Mdrai everything they wished to know would make much difference. It had been nine days, and he was not going anywhere. Besides, he and Harvey were going to be spending a lot of time together anyway. “I would like to leave now,” he said, rising from his seat. “Fkat is not finished, Noel Loveridge,” the old woman answered harshly.